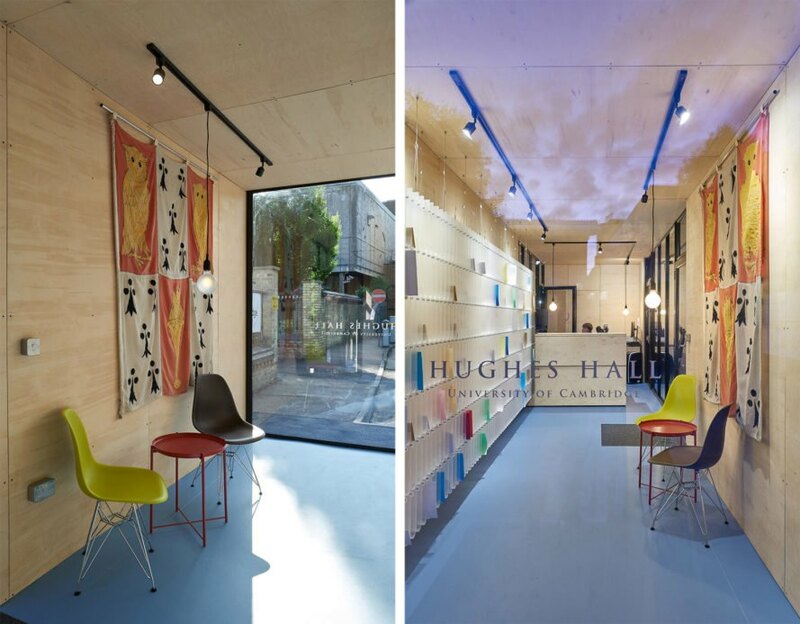 Cambridge-based architecture practice Neubau has turned a shipping container into a porters’ lodge and reception center for Hughes Hall, a college that had, until recently, been the only college of the University of Cambridge in England to not have a porters’ lodge. 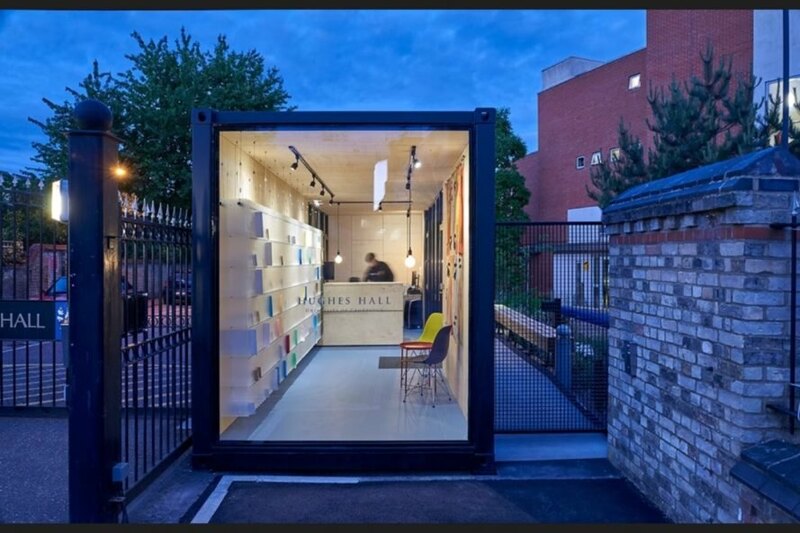 The architects turned to cargotecture as an architectural solution to the client’s brief for a fast and temporary solution that wouldn’t detract from the neighboring Grade II-listed building. 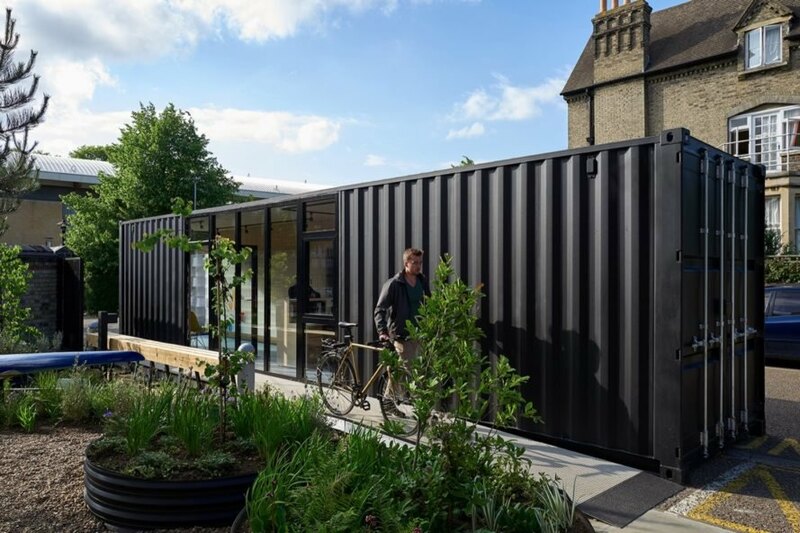 Completed in just a little over a month’s time, the repurposed container has planning permission to remain on site for the next five years. The Hughes Hall porters’ lodge is split into three main areas laid out in a linear format: a glazed entrance opens up to a waiting area with a table and chairs and a full-height wall of 476 pigeon holes for the students’ mail; the office and reception is located in the middle; and a spacious storage area for storing parcels is located in the rear. The cargotecture design was selected over initial proposals for a rented modular Portakabin because of the container’s dimensions that fit perfectly at Hughes Hall’s entrance gate. The interior footprint measures approximately 323 square feet. Sections of the converted shipping container were cut out for glazed openings that let in plenty of natural light and views of a newly landscaped garden. The existing doors of the shipping container were preserved and can be opened for easy storage access. The unit is lined with insulation and birch plywood, and the floor is covered in blue vinyl that matches Hughes Halls’ official color. The porters' lodge is located by the entrance to Hughes Hall. The architects used cargotecture to create a functional and fast solution for the college's need for a porters' lodge. The interior includes a waiting room, office and storage facilities. The corrugated exterior was preserved. A look at the porters' lodge floor plan.